Remember walking down the street and spotting in the endless stream of Nissans and KIAs a posh luxurious and shiny Bugatti Veyron? Even if this car was pulled over the roadside, your eyes would still catch it. The same is true with one particular shape of eyewear – the round frames. Different shapes of shades may seem ordinary and daily but there’s only this one shape that won’t leave anyone indifferent. Round shaped glasses seem to be the Bugatti Veyron in the eyewear world: they are elegant, extraordinarily chic, and gives the wearer a luxurious feel. Round shades absorb everybody’s attention. Let’s face it, if this accessory is chosen correctly suiting one’s outfit, it will fix all eyes on the person’s face accenting all their natural beauty and boldness. Still on must be careful while picking up this shape as it may not suit everyone. Realise that any kind of eyewear should be chosen depending on the face shape. The round shaped frames will undoubtedly flatter those with oval or square facial forms. The round shaped eyewear counterbalances proportions of the face. If one has a pointed nose or chin, round shades are a must in their wardrobe. Those in round frames will always look spectacularly stylish and will naturally stand out against a background of the crowd. In addition to that, mostly this eyewear suits long-legged beauties that will look bold and overbearing wearing this accessory. Legendary ROUND miracle is back! Retro, stylish, daring and cool. These are only several out of dozens of adjectives that may help you describe round eyewear frames. The pick of their popularity concurred with legendary Beatles, at the time when John Lennon was constantly wearing round eyewear and it became hard to think of him without those round shades. Round sunglasses became an integral part of Lennon’s image. Therefore they became a legend, just like Lennon himself. After the era of Beatles there were times when people completely forgot about this round miracle that is capable to add a particularly special thrill to the outfit. Nevertheless, those glasses couldn’t be forgotten for good. That’s why it’s no surprise that they’ve become one of the main eyewear trends of this season. Music wasn’t the only part of our life where round glasses played a really significant role. The same story is with the movies. Almost all the best characters in iconic movies of 70s wear round glasses accenting that at that time they were the peak of popularity. But it’s not only the 70s. Round eyewear appeared now and then in the cinema industry for years, making the characters look thrilling. In some movies they surely look dangerous (think of Morpheus in Matrix or Woody Harrelson in Natural Born Killers), in others they emphasise vulnerability (remember Molly Ringwald’s creative character in Pretty in Pink or Harry Potter). Celebrities who adore round eyewear can also boast of having a perfect taste. Wearing such glasses means thinking through every detail of the outfit. However, the result is worth it: round shades help them look gorgeous and trendy leaving an unforgettable impression behind. Keira Knightley is admitted to wear the most gorgeous outfits not only on the red carpet, but also for casual outings with friends and family. Being a great connoisseur of fashion eyewear, Keira is often seen wearing round shaped glasses. Wearing round frames helps her soften the angles and look brilliant because she has a square face with a strong jaw line and a broad forehead. The celebrity has been spotted wearing Cutler and Gross 0737 Humble Potato. This model produced by a famous London eyewear brand is recognisable for its perfectly round smooth frame and dark grey lenses. Due to the caramel colour the eyewear is a perfect Fall accessory. English model and actress Rosie Huntington who has an incredible taste in fashion also seems to be a big fan of the round frames. The leggy model was spotted wearing Jimmy Choo’s Andies for an outing. Best known for her work for lingerie retailer Victoria’s Secret, Rosie looked fabulous in a short white dress and minimalist makeup that was paired with the Andies sunglasses. 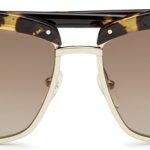 This eyewear model is a modern take on retro round sunnies. This perfectly round shape sunglasses is characterised by a crystal fabric detail and Rosie simply oozed elegance with the pair. The round eyewear trend isn’t for female celebrities alone. Men also adore such glasses. The reason is probably because they look even sexier and more desirable in such frame shape. For instance, think of Johnny Depp. He wears round shaped glasses so often that he can be easily associated with them. He has been spotted in public wearing American brands such as Ray-Ban and Moscot. Another male celebrity is the Irish actor Aidan Turner who is well-known for his performance in the three-part fantasy film ‘The Hobbit’. While attending the 2016 Wimbledon Championships at the All England Lawn Tennis Club in Wimbledon, London, the actor wore the Dunhill SDH006 sunglasses. This eyewear is a combined acetate and metal model and has a round-shaped front piece combined with elegant metal temples making Aidan look nothing short of dashing. Giorgio Armani offers us, perhaps, the most sophisticated eyewear models the brand has ever created. Male and female round glasses are extraordinarily distinctive and perfect for those who want to dress the classic style with something eye-catching and neat at the same time. With its perfect smooth lines Giorgio Armani AR7040 is a model that has nothing unnecessary and odd, nothing loud and flashy. This is where the fascination and success of this eyewear is hidden. Another round shades model called Giorgio Armani 6016J is mostly featured by the colour of the lenses and thin sides of the spectacles. There’s no way anyone can stay unnoticed wearing sunglasses like this. There are a lot of Armani’s admirers among the celebrities: everyone considers it an honour to wear the eyewear of this prominent brand. With its vintage echoes, Chloé’s Carlina embodies the true, sophisticated expression of the Chloé spirit. This eyewear model features an oversized frame, embellished by a translucent plastic insert that emphasises the roundness of the lenses, and concentric metal circles suggesting a spiral movement. The lightweight materials and subtle shine enhance the soft nuances of the lenses. The metal elements are matched with transparent plastic parts in shades of Peach, Grey and Caramel, or with solid plastics in Havana Blonde and Khaki. Nowadays eyewear designers demonstrate us their endless fantasy creating the most amazing shades. Prada is no exception. Its PR27NS Minimal Baroque Sunglasses will make sure that the wearer receives a lot of compliments. This model is perfect in its refinement combining shiny rococo temples with a beautiful round frame. Such celebrities as Katy Perry and Gwen Stefani were spotted wearing this eyewear. 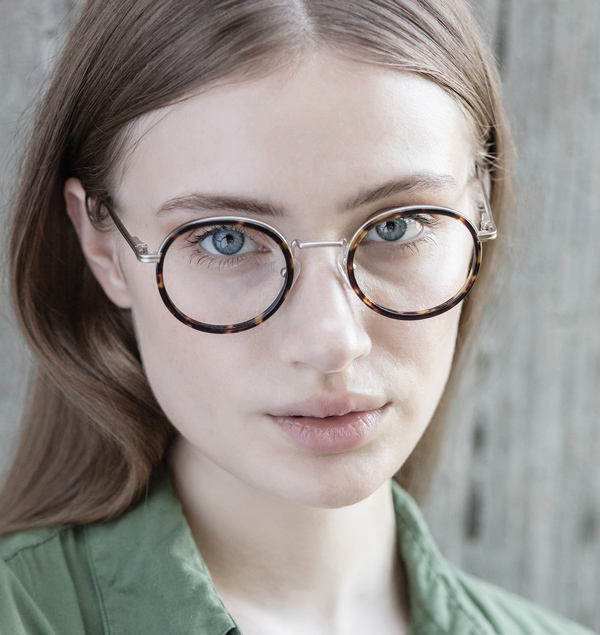 Another brand that is seen producing round frames is Komono. The optical line of this brand brings contemporary styles and superb quality at a competitive price point. This collection is a perfect representative of the trendy and confident women of today. The brand’s Clovis eyewear model is a simple yet beautiful optical wear. The round shaped opaline frontal colours are matched in contrast to full tone colours of the temples. 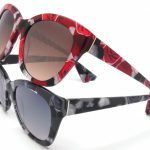 A fashion brand Sunday Somewhere has recently launched the eyewear collection devoted to round eyewear frames. Creative approach and unconventional ideas of designers are depicted in every small detail of the new collection. Matahari, a pair of round unisex shades available in lenses of different colours, strikes the eyes with its elegance and originality. What’s more is that each model of this collection has its own charm and thus most celebrities own at least one pair of Sunday Somewhere round glasses. Jessica Alba was spotted walking down in Central Park wearing the Yetti sunglasses in Dark chocolate tortoiseshell; Beyonce attended an NBA basketball game in her new stunning Isabella Sunglasses in rose gold; Rihanna was seen at the airport wearing Valentine frames in black. The rounded, metal JC722S frame by Just Cavalli is slim and ultralight, evoking the folk style of the sixties. The frame features exclusive and eccentric details: the lower left side is attached to the temple by a rubber wire with a small decorative star. The mirrored lens version has dazzling laser-printed stars on the lenses. The sunglass is feminine in every way and great for almost any occasion. If you have ever been to Barcelona you know that this is a city of art and contrasts. Brilliant works of Gaudi alternate with highly modern buildings, crowded La Rambla contrasts with a quiet Park Güell and a street fashion is set off against a high fashion. All these controversial features are expressed by Catalan fashion eyewear brand called Etnia Barcelona. Beyonce, Rachel McAdams and Cara Delevingne are often seen wearing Etnia Barcelona round frames such as MALMO, WLA AFRICA, X-Berg and Yokohama. kate spade New York is another brand that is always optimistic, often unexpected and wonderfully original. There’s an air of eclectic individuality and romance that permeates the collection and a graphic strictness with a feminine lightness of touch. She reinforced the classic shape for the fall/winter 2016 eyewear collection with Khrista/S. Offering spellbinding sparkle, this sunglass with its strikingly round silhouette make the magic happen through the razzamatazz of glittery fronts and dramatic, wide temples. Another notable sunglass is Jiro; the newest style from the Mykita Mylon collection. Perfectly round complete with protective side-shields, Jiro was inspired by classic welding goggles – enhanced sun protection in a refined steampunk aesthetic. Mykita Mylon sunglasses all come with super flat lenses that create a strong, graphic look. Jiro blurs the border between fashion and sports. The sunglass is a state-of-the-art design coupled with a material that boasts individual adjustability, low weight and extreme durability making this eyewear both an outstanding sporting companion and a perfect everyday accessory. Round frames seem to win the hearts of the public at the velocity of light. It doesn’t seem strange that people love them: they have an ability to embellish any outfit, and who wouldn’t like that? Coming back from the temporary oblivion, round frames declare that they have come back for good. One For The Road… One For The Workplace!